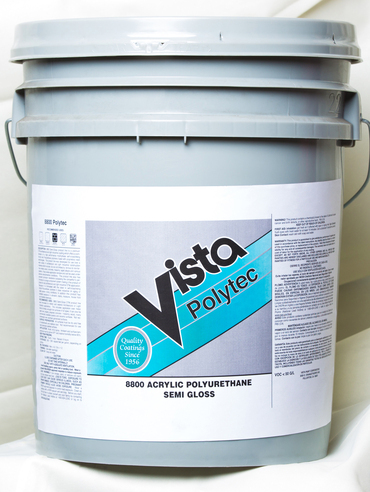 Polytec Semi-Gloss is a premium plus exterior, single component, high performance architectural & light industrial coating, which is uniquely formulated with a combination of high performance self-crosslinking acrylic & polyurethane polymers fused with proprietary resin technologies. This product was developed for use over a wide variety of surfaces which include ferrous & non-ferrous metal, wood, concrete, masonry, aged alkyds & various plastics. It has a wide application window, can be used under extreme environmental conditions & as a direct to metal (DTM). It offers excellent flash rust/early rust & long term corrosion resistance as well as resistance to abrasions, stains, moisture & both household & industrial chemicals. It has excellent color & gloss retention & does not yellow, is fast dry & suitable for use in USDA inspected facilities. Recommended Uses: For use on metal doors, frames & wrought iron surfaces of all types. It can also be used over properly prepared concrete/masonry, wood, many commercially available plastics & ceramic surfaces. NOT for use on kitchen cabinets or table tops. For kitchen cabinets use Polytec Interior products.